Can the rich history of the ŠKODA brand team up with modern geocaching? Of course it can! That’s why we’re creating historical travelling coins. 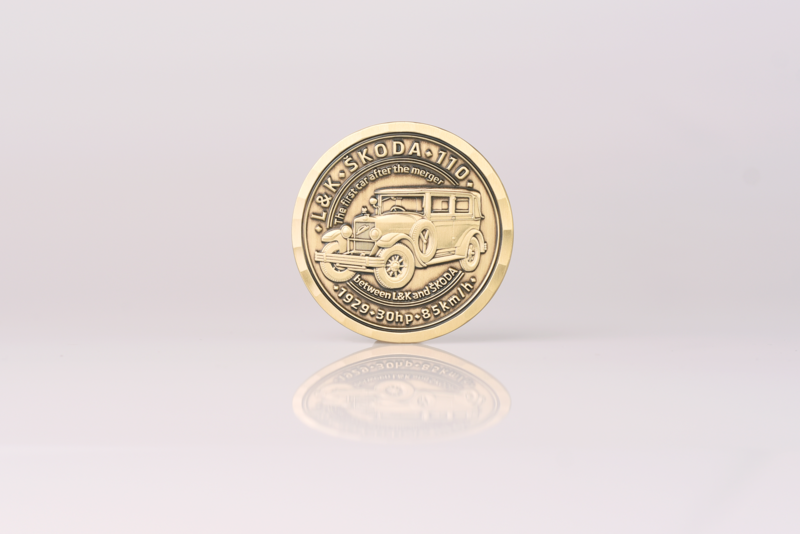 How are these unique geocoins created and what legendary vehicles will the ŠKODA Heritage coins represent? Geocoins are intentionally made to travel. And they do a lot of it. Any experienced “cacher” will tell you that the purpose of these travelling coins is to make their way from cache to cache (i.e. containers marked with coordinates in which the travelling coins are deposited) and to each a pre-determined target. 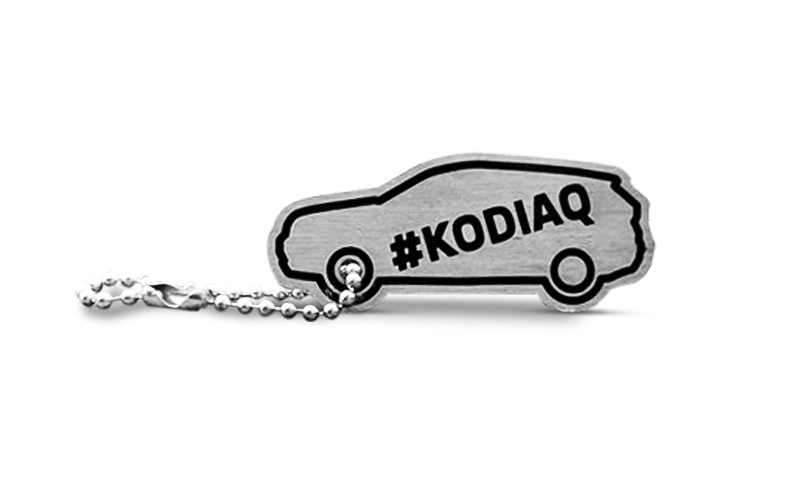 You’ve already seen geocoins travel literally tens of thousands of miles around the world with #KODIAQ travel bugs, the goal of which was to reach the Alaskan island of Kodiak. Experienced cachers, please bear with us as we briefly introduce geocaching. Geocaching is a social game combining tourism and sport. The objective is to find a cache that someone has previously hidden in an unknown place. The cache’s coordinates are published on the internet so that others may find it, record themselves among other finders, and perhaps exchange items found in the cache. Travel bugs and geocoins, which bear an identification code and usually have a predefined destination, as in the case of the #KODIAQ coins, work a bit differently. Thanks to the codes imprinted on the coins and bugs and recorded at geocaching.com, it is possible to monitor their position and track their progress. The path of a geocoin begins much earlier, however. 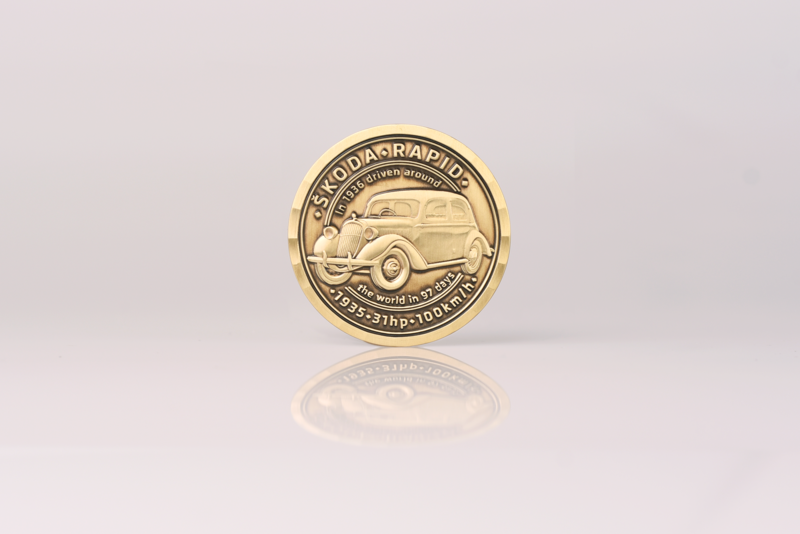 As true of all valuable things, the historical ŠKODA Heritage coins are built on a clever idea and a determination to do something exceptional – and that perfectly describes our travelling geocoins. But let’s talk first about the basics. Each geocoin begins its journey on the table of a designer, who is tasked with creating the initial idea and mission of the coin. For this phase, the idea was clear – thanks to the ŠKODA brand’s rich history and a whole line of exceptional models, there was plenty from which to choose. The coins were given their actual appearance by designer Slávek Hoblík, who has years of experience in creating geocoins. “For each model of car, a 3D design was created and the shape of the future coins was born, although still only in a virtual state,” explains Hoblík. The second step is the actual production of the coins. 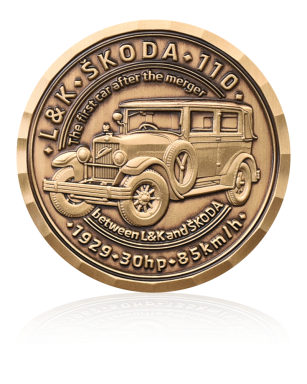 Historical ŠKODA coins are produced from refined material using minting technology. Geocoins are minted by means of hardened steel dies on a high-performance press, which enables the elaborate details of the historical vehicles to be beautifully visible. Before the geocoin is sent out into the world, the finishing and most important touches need to be made. Designer Slávek Hoblík tells us more: “There are many finishing touches, but one of the most important is to add a patina, which accentuates the relief. Adding coloured enamels and engraving the tracking number are also important for the overall impression and particularly for the coin’s functionality. Coloured enamels are applied by hand and are fired in a kiln.” Thus, a perfect travelling coin with a detailed relief is born. 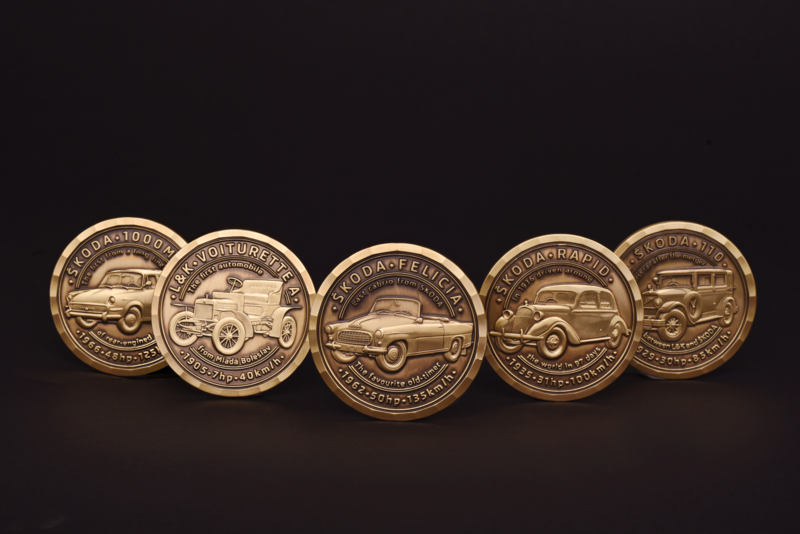 Each coin depicts one iconic model that has made its indelible mark on the history of the ŠKODA brand dating back more than 120 years. The collection would have been incomplete without the first automobile from the workshop of the founding Laurin & Klement duo in 1905 – the LAURIN & KLEMENT VOITURETTE A. The merger of the LAURIN & KLEMENT auto plant and ŠKODA Plzeň machine works is commemorated in the LAURIN & KLEMENT ŠKODA 110 model, which carried the logo of both companies on its radiator. 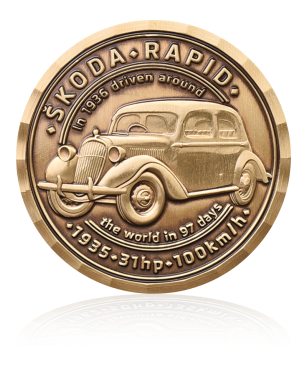 Several years later, the renowned Czech explorers B. J. Procházka and J. Kubias took a trip around the world in their ŠKODA RAPID from 1935, which is the next model depicted on the coins. 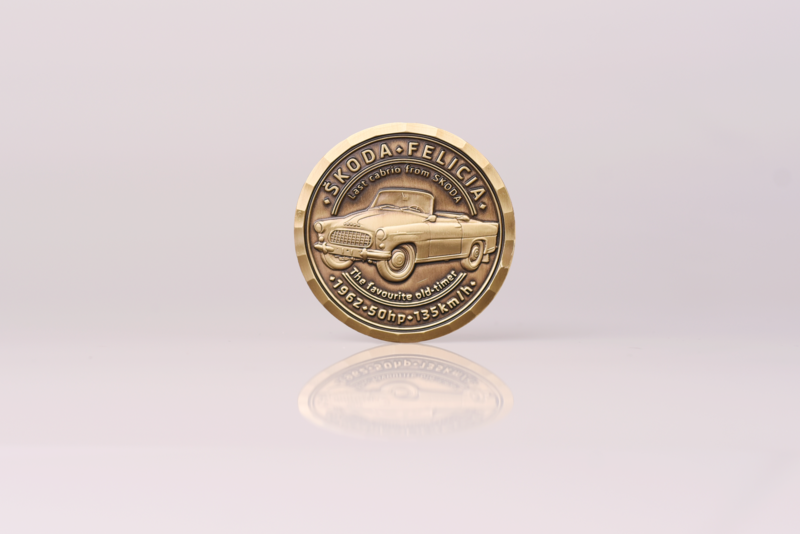 The following coin shows the last convertible produced by the ŠKODA auto plant – the stylish FELICIA model from 1962. 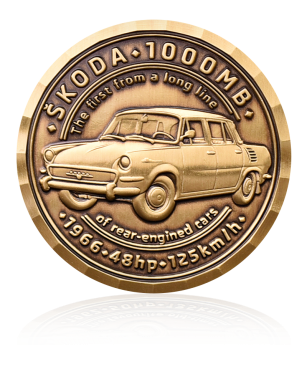 The fifth coin to complete the collection is the revolutionary and iconic ŠKODA 1000 MB, of which more than 400,000 copies were sold in the 1960s. A total of 500 ŠKODA coins are now hidden away in various nooks and crannies around the world. 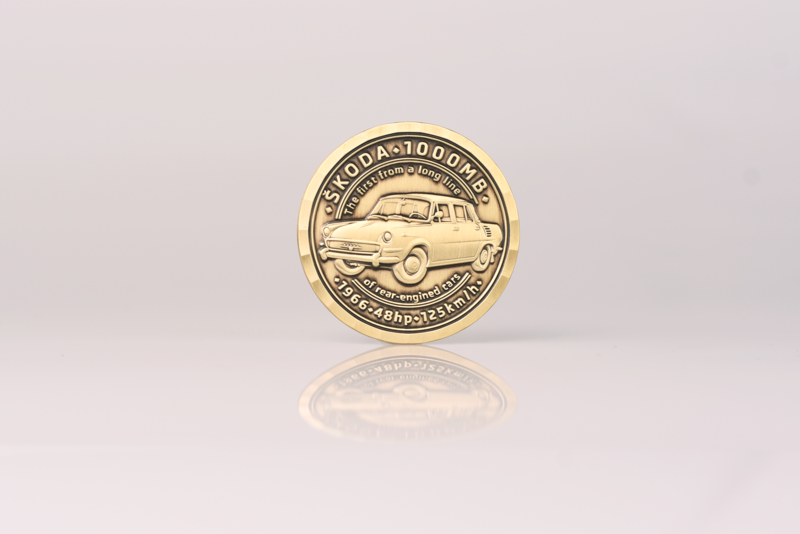 The ŠKODA brand has launched several diverse competitions in its efforts to encourage as many of you as possible to seek out these unique historical coins. Not only will prizes be awarded to the first and quickest “cachers” to find all five coins, take their photos with them, and send them to Facebook ŠKODA Outdoor Adventures, but we’ve also prepared rewards for those who can get a coin as far away as possible from the place they originally found it. To learn more about these competitions, just go to the Facebook page shown above or to www.skoda-auto.com. Would you like to search ŠKODA geocoins? 1. Sign up on Geocaching.com. 2. Click on “Play” which is situated in the menu in the upper part of the website. 4. You will be redirected to the Trackables Write the name of your coin or its code to the browser. 5. 5. Confirm the name and you will see a list with all of the coins with this name. 7. You can find the code of your coin by its name. This code will help you to find your coin location either on the website Geochaging.com or phone application. 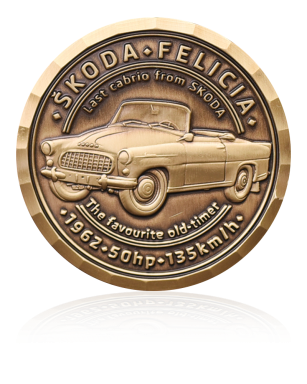 • ŠKODA FELICIA - 1962 Geocoins. you are not an activated catcher yet? Create an account on Geocaching.com.